The Singer Cycle Company of Coventry (UK) was first formed in 1875 when George Singer left Coventry Machinist to set up his own business. 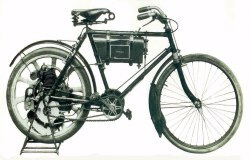 Singer then produced the worlds first safety cycle and in addition, George Singer also patented the curving of the front forks of a bicycle to aid steering. (A feature still found in modern bicycles) This innovation helped turn Singer into the world's largest cycle manufacturer. 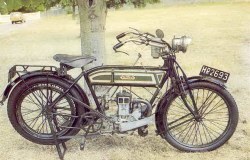 In 1901 Singer obtained the manufacturing rights of the Perks and Birch motor wheel and from it made a front wheel drive tricycle in which the engine was fitted within the wheel. Singer then began to adapt and improve upon the design producing much more conventional 3-wheelers that amongst other changes used a steering wheel rather than handlebars. 1905 Singer The Singer Tricars of 1905 were powered by either a 6 hp or a 9 hp water cooled engine that was produced by Riley which helped the Singer perform well in Time Trials and competitions. 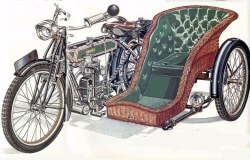 Ironically using the Riley engine made the Singer 3-wheeler one of Riley's main rivals in competitions. 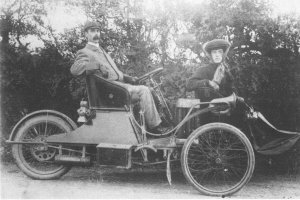 In 1905 Singer had produced their first 4-wheeled car and so their 3-wheelers were manufactured up until 1907 when production turned completely to the 4-wheeler. This picture was kindly provided by www.3wheelers.com.